This year, I was presented with an opportunity to join a small cohort of chemistry teachers that would implement, customize, and review interactive video-based lab investigations available from Pivot Interactives. Now that I have integrated several of their activities into my classroom throughout the past few months, I have realized that Pivot Interactives is different than any instructional resource I have seen. As a result, I cannot help but share some of my own experiences, useful things to know about this resource, and encourage you to give it a look. Whether you are searching for ways to make your assessments more authentic, develop lab skills, or increase opportunity for meaningful science investigation, I am confident you will find value in this resource for your classroom. Matthew Vonk, one of the co-founders of Pivot Interactives, wrote a ChemEdX blog post in April describing the interactive video experiments. Based on my own experience, I tend to describe Pivot Interactives as a web-app that provides teachers and students with a variety of high-resolution interactive videos that are creatively designed in a way that allows students to record and analyze data, manipulate variables, compare their predictions to observation, and ultimately apply their understanding in an authentic setting. It was Peter Bohacek (co-founder) who described it to me in a similar manner a few months back and I immediately became intrigued. So, what do I mean by interactive videos anyway? What kind of witchcraft allows someone to change the contents of a video? While you cannot literally manipulate the content of what is recorded in the videos, they are interactive in the sense that you can use on-screen tools to make precise and accurate measurements and choose from multiple videos within the same experiment to simulate the act of changing variables. For example, I recently had my students apply their understanding of enthalpy of reaction by mixing different concentrations of HCl and NaOH. Students could measure the enthalpy change by mixing 0.5 M, 1.0 M, or 2.0 M solutions and use that information to predict what the final temperature of the solution would be. But what about making measurements? While many of the videos contain carefully embedded measuring devices already, most allow students to make actual measurements by manipulating on-screen tools. 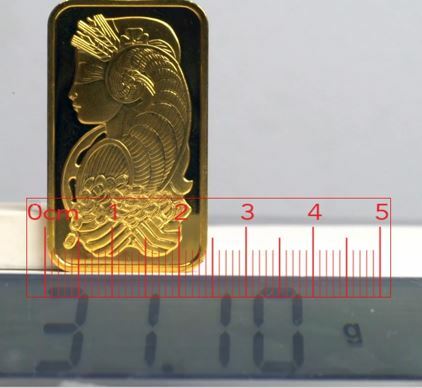 An example of this is a density activity where several rare coins and ingots made from unknown materials are placed on a scale and students can access a ruler to measure the dimensions of the object. This specific activity helped me easily evaluate my students’ ability to make appropriate measurements, just like any in-class lab would. If you are like me, this is the part where you start asking yourself, “Wait…doesn’t PhET already allow us to essentially do the same thing?” This is a reasonable question considering online simulations like PhET allow you to choose from a variety of concepts, manipulate variables, and even make measurements. While Pivot Interactives may share some similar features with interactive simulations on the PhET site, its real value is grounded in its ability to replicate actual lab experiences that can supplement instruction in ways I continue to find opportunity for. As I gain more experience incorporating these activities, I’ve started to notice some of the underlying benefits that Matt and Peter mention in their blog. Quick data collection means students have time to focus on experimental design, analyzing data, and error analysis. Considering the variety of labs we do, big or small, how much time is lost due to students’ lack of experience with lab equipment, misunderstanding of how to execute the lab, or even the natural amount of time it takes to perform the lab? Since many labs are completed shortly before the end of the period, we are often forced to wait another day to analyze and interpret the data. Helping students develop these lab skills and improve recall of what they investigated the other day is important and most certainly has its place. However, is every single lab done in class so valuable and effective at building these skills that we cannot imagine a scenario where it could not be supplemented in some way to allow for more quality instructional time? Slow-motion and time-lapse show details that would be missed during real-time data collection. Observing certain phenomena in slow-motion can have obvious benefits. Just look at all the slow-motion chemistry videos on YouTube. Additionally, a time-lapse of certain reactions can allow for more effective time in class. For example, many teachers do some version of a stoichiometry lab where students make a precipitate but are forced to let it dry overnight so students can come back the next day and determine their yield. A time-lapse of this reaction and drying process allows the entire process to occur within minutes while still serving the same purpose, with respect to applying an understanding of chemistry. Interactive measurement tools can be more concrete, less black-boxy, than electronic data collection. Making measurements from actual lab equipment within the video that reflect the same tools in our lab can help build a sense of familiarity. Then, when the time comes for students to use these tools in class, it is likely to seem less foreign to them and may actually improve their ability to use the tools effectively. Freedom from practical constraints means students can see dangerous, time-consuming, expensive experiments, and multiple trials. Sure, students can learn about density with samples of copper, aluminum, and other inexpensive materials we have laying around. But what about gold or silver? Sorry, but my students are not putting their hands on my gold! How cool would it be if students could investigate how the density of an actual Olympic gold medal differs from a fake one? What about the reactions students do not get to experience due to the hazardous nature of certain chemicals or the amount of money it costs to buy a certain reactant? High-quality videos can allow for these opportunities so that students get to see the beautiful yellow precipitate of lead (II) iodide, or the fascinating appearance of pure silver coming out of a solution of silver nitrate. What are some ways Pivot Interactives can supplement my instruction? Like any worthwhile educational resource, its goal is not to replace the good things you already do. Rather, it should be viewed as purely supplementary to your instruction. So, here are a few ways Pivot Interactives can make the good things you do even better. Using Pivot Interactives instead of word problems—making assessment more authentic. At some point, we all check for understanding. To do so, we typically write word problems that ask to apply some recently-learned concept. Whether they are on a piece of paper, embedded within a PowerPoint, or created in a Google Form, our questions are often separate from actual experience. While we should expect students to be capable of answering questions that describe some hypothetical scenario, short in-class activities where students can apply understanding to concrete examples can easily supplement our options as teachers. Just the other week, I replaced one of my paper-pencil quizzes with a Pivot Interactives video that asked one meaningful question centered on the ability to apply a concept to an actual situation. Word problems will never go away, but some of our questions can become more authentic. Flipped Labs—Though I have yet to pursue this option as part of my instruction, I love its potential and can easily imagine integrating this next year once I get more experience with the activities. The rationale behind it is fairly simple. Labs—especially inquiry-based labs—take a lot of instructional time. As a result, critical parts of an investigation, like experimental design and data analysis, are often left for students to complete at home or allocated for yet another day. However, these features are typically the most challenging aspects of an investigation for students. Allowing students to measure, observe, and record data outside of class can allow for more instructional time spent on helping students through these processes. An insightful post on how some AP physics teachers have decided to utilize Pivot Interactives for certain labs using a flipped model can be found HERE. Using Pivot Interactives as a digital lab notebook. Another great post on how this topic was creatively pursued can be found HERE. Bringing opportunity to students. As much as we would love for all classrooms to be fully stacked with all the latest data-measuring tools/software or a stockroom full of endless chemicals, we know this is not the case. Consequently, many teachers cannot pursue creating investigations for a variety of chemistry topics, simply due to the lack or abundance of the necessary tools. With Pivot Interactives, teachers can pursue certain labs they may not have otherwise even thought about and students can experience the same chemistry in action. Additionally, the fact that Pivot Interactives is accessible via iPad, PC, Chromebook, Mac, or even a phone, allows for more opportunity for everyone. Connecting the macroscopic and sub-microscopic levels. The videos in Pivot Interactives can serve as an accurate and efficient way to supplement notes or discussion. When giving direct instruction, I will often find myself placing too much emphasis on the particle level without providing a visible connection to the macroscopic level. To do this, I might show a demo or play some video from YouTube. However, since the videos in Pivot Interactives are of high quality and tend to be rather short, you can easily exit out of your notes and reveal the macroscopic implications of what takes place at the particle level. What’s the thing I like the most? As a teacher, having the freedom to create or edit something within my instruction based on the needs of my students is incredibly important to me. So, when I found out the activities in Pivot Interactives are completely customizable, I was thrilled. By default, all the activities are naturally set up as investigations with a variety of questions. However, once a certain topic captures your attention, you can move the entire investigation into your class library and remove, add, or edit questions as you see fit. You can ask virtually any type of question along with inserting your own media and mathematical equations. Having this option has allowed me to make use of this resource beyond the lab setting and into other important areas of instruction such as assessment, practice problems, and notes. For any resource, the more ways it can meaningfully enhance my instruction, the more valuable it becomes. As the team at Pivot Interactives continues to improve the capabilities of their product and expand the number of chemistry-based investigations, the better it will become at supporting quality chemical education. Considering this is the first year they launched activities for chemistry, I am excited to watch and participate in its growth. Give the Pivot Interactives website a look and even request a free trial to see the potential value it could provide for your classroom!